It is amusing to contrast our purchase decisions. Mine was based on web heresay and imagined expectations based on the 8x42 FL, little more than a "wild hare". Yours could hardly have been better informed! The image and build quality are certainly outstanding, but getting along with the size and weight is an issue that must be faced. For daytime use carrying it long distances I recommend something besides a neck strap. I use a "bandolier" style 2" wide nylon web strap, slung diagonally across one shoulder. A harness would probably be even more comfortable, but I don't want the complication. I hope you enjoy the big bad Zeiss as much as I do. Thanks Ron, I am sure I will enjoy them a lot! For long walks, I will likely take the 7x42FL with me. It is very light and compact in comparison. This thread hasn't helped me at all ! I have been considering SLC 8x42s or SLC 10x56s for hand held and casual use along side our telescopes. Head says 8x42, heart says 10x56 ... help ! ? Under the stars, the 10x56 are the superior binoculars. If you carry them all day or have small hands, the 8x42 are a better choice. Of the new SLC series, the 56 are better made, with a nicer focussing mechanism and better and brighter optics. As abonus they have bigger aperture too. In the SLC56 line, only the 15x is available in the US, apparently. Perhaps the 8 & 10 will be coming along, soon? I have no information on the US availability of the new 56mm SLC models. But for stargazing, the SLC 15x56 is the sweet spot in their new line. It just works best when accompanied by a lower power model, like an 8x42. If you go back to page 3/4 of this thread, you will see discussion regarding the availability of 8x/10x 56mm SLC in US. Apparently a patent issue is blocking Swaro to sell them in US altogether. Please allow me a question on the 3x booster as used by you for test purposes. I guess you are refering to the Zeiss Tripler, right?. Is it possible to attach this Zeiss part to the Swaro 15x56 SLC, and if yes, how is it attached to the Swaro eyepiece? What I use is the Zeiss 3x12 B (see picture below). 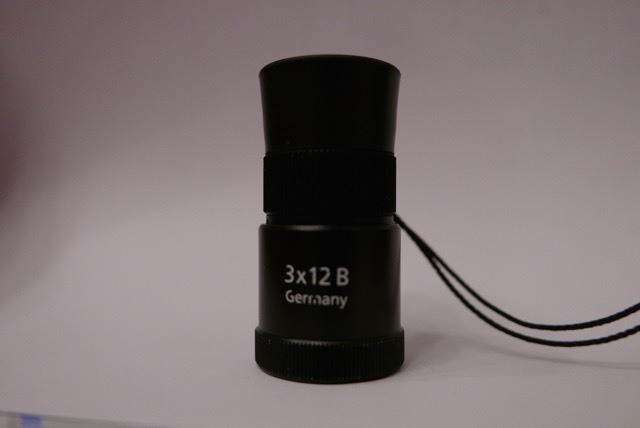 One can buy an adapter to connect it to the Zeiss FL binoculars. With the Swaro SLC's, I just keep it in position by hand. (...) With the Swaro SLC's, I just keep it in position by hand. Ok, thanks for the info, Erik! I am buying a 8x56. Most likely the Swaros. But the internal reflection that you pointed out in the Swaros is annoying to me. Do you have any comments on any possible effect of this reflection to the view, in comparison with the Zeiss? Is there any in theory, and did you see any? Yes, you can see the internal reflection in the Swaro SLC. With an object like the moon far outside of the field of view, some reflections are visible in a dark field with stars or nebulae. On axis, the Zeiss are my favorites, off axis the Swaro SLC's. The Zeiss are a bit better made, but no longer available new. You may want to compare the Zeiss Victory HT 8x54 and Swarovski SLC 8x56 and see which you prefer. I have no personal experience with the HT 8/10 x 54 yet. I won't be able to test any of them before I buy. I don't know if the HT has anything similar to the SF. I tried the SF 10x42 and did not like the handling and the image. The Zeiss HT and SF series are not similar. I've had a pair of the Swaro 15x56 SLCs (the latest version) for 5 months now but have not had very many opportunities to use them astronomically. I have used them during the daylight hours several times (and with them mounted on a camera tripod) and I've been very pleased with their performance. Today I even tried them on my monopod and they performed better than I was expecting and more than good enough that I will consider using them again with a monopod. No other 15x or higher power binocular that I've ever tried using before with a monopod performed well enough that I wanted to do it again. I think the 15x56 SLC's relatively (for a 15x binocular) small size, light weight and balanced design are what make the difference. When it comes to just using the 15x56 SLCs in hand hold-able mode, I'm still not a convert. I've read comments from other users who claim that are usable that way. I agree that they are more hand hold-able than any other 15x binocular that I've ever tried, but for me the jitters still set in rather quickly (even when my back and neck are being supported by a ZG recliner that's in a tilted back position) and that very quickly spoils the view for me. However, I have no complaints about that because when I purchased them it was with the expectation that I'd only be using them with a mount. Edited by John F, 01 April 2017 - 11:24 PM.